I’m really awful about buying gifts for people for holidays. It seems so superficial, doesn’t it? You know, just buying some random gift to satisfy your holiday quota? (I prefer to make things for people, like that DIY craft pack that I made for my friend’s 40th birthday). 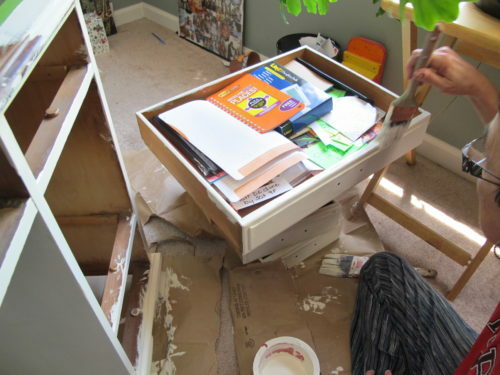 So when my mom asked me to skip work and drive to my hometown to spend a Mother-Daughter day painting this desk with her, as her Mother’s Day gift, I knew it was the perfect heart-felt gift that I could give her! 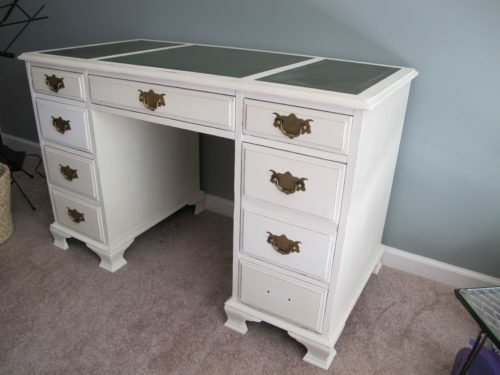 But she had a change of heart recently and wanted to paint it white. 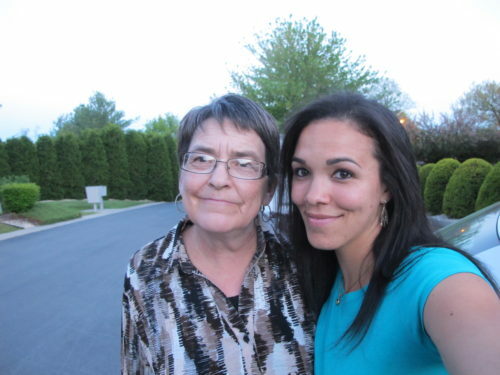 So off I went, for a Mother’s Day “girls day”! AND MY MOM LOVES IT!! 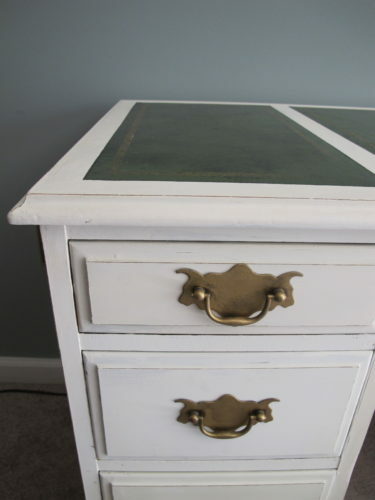 We painted it in Annie Sloan Chalk Paint “Old White”, with a light distressing around the edges, and two coats of Annie Sloan clear wax. 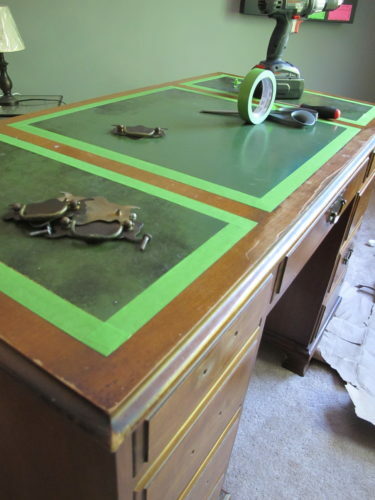 It was such a dramatic makeover that my mom kept “Ooohing” and “Ahhing” over the desk. And rightly so. It looks so rich and beautiful now! And what she most wanted was for her “office area” of her living room to be brightened up a bit. Now that the desk is white, it’s definitely a happier corner! It’s funny how you never know how DRAB something was until you paint it! 🙂 It’s such a huge difference for her corner! 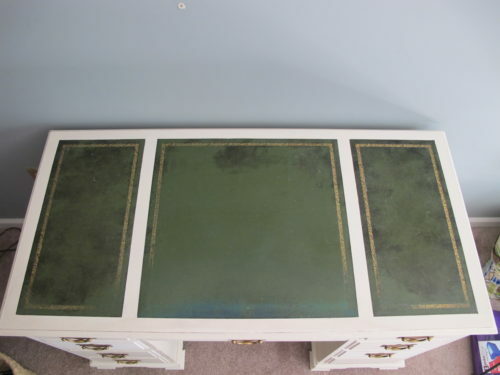 You may be wondering about the top of this desk. 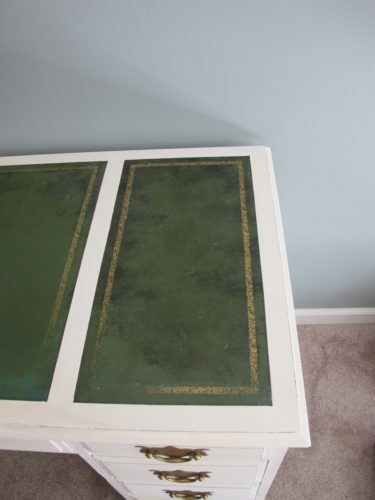 It’s the existing leather panels that came on the desk! 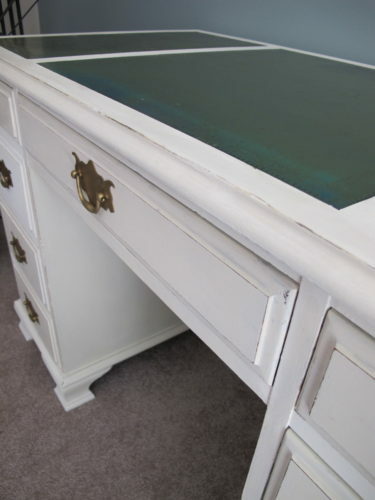 I also thought they would look better painted, but once I saw the “AFTER” of this desk when we were done, I really appreciated the worn, dirty leather on top. It gave the piece some genuine aged character. We decided to keep them instead of painting them. And I only get to see my mom about once every 3 weeks or so. 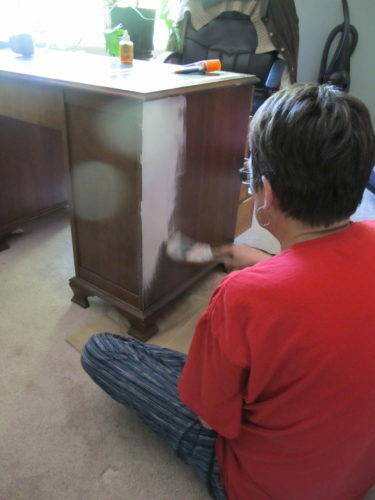 So to get this chance to share with her my love of painting furniture, and show her how I make things pretty again, was a great gift to give her! 1. It’s missing one of the handles. We only have 8 of the 9 handles. Did you already notice? 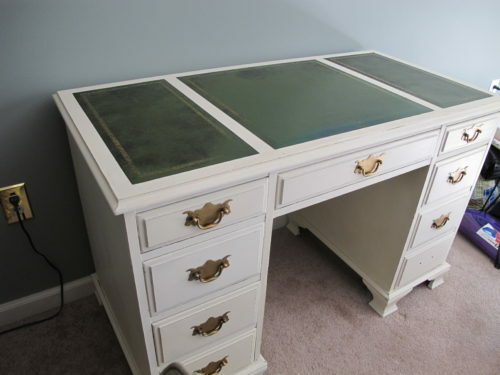 😉 When I look at my original photo of this desk, when I first brought it home from the thrift store, I had it. But now…?? Who in the world knows! Somethow, I think I lost it in the transport to Mom’s house. But….um, who cares? We’ll just put that drawer to the far right of the desk and hope that no one will notice 🙂 No one really comes to visit, anyhow. It’s not even that noticeable. And I surely don’t strive for perfection! 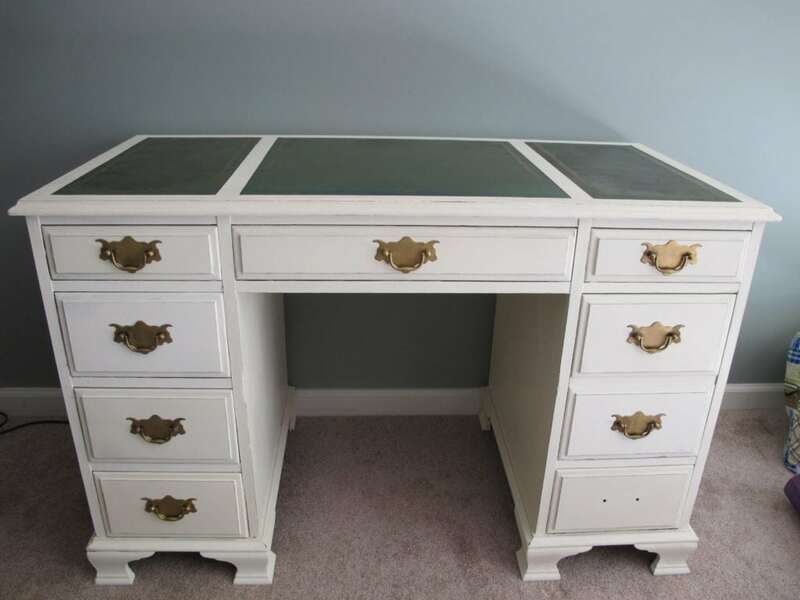 EDITED TO ADD: Readers in the comments area recommended removing the center drawer handle and using that for the missing one. 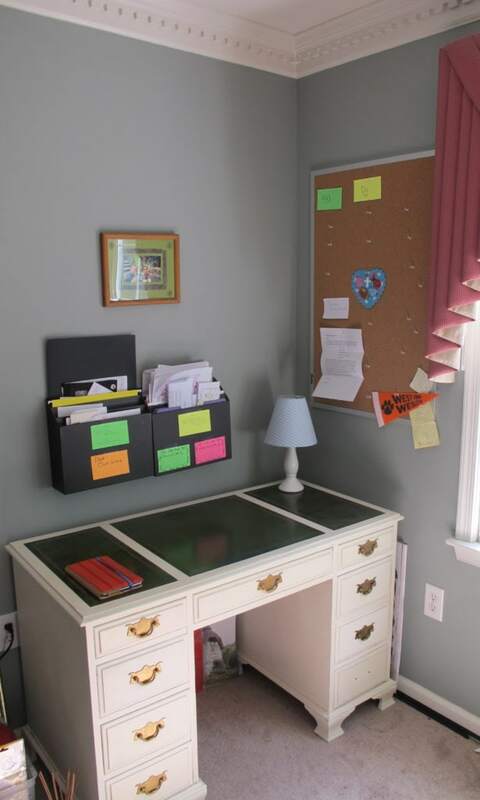 Then, find a cool mis-matchy one to go on the middle drawer! Love that idea! 2. The front edge was badly chipped. 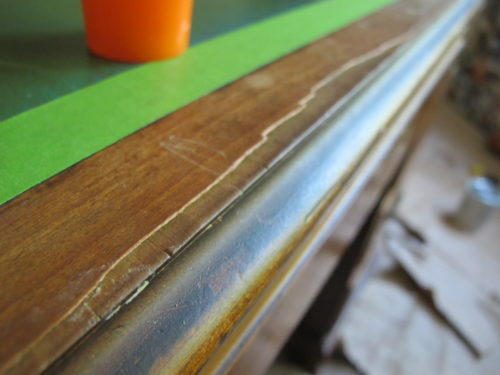 I used a bit of Gorilla Glue (best stuff EVER) to glue down the piece of wood that was coming up. After a bit of filling in the chipped area and sanding to even it out, I painted that area, lightly distressed the edges, and applied 2 coats of clear wax. Hardly noticeable now! 3. 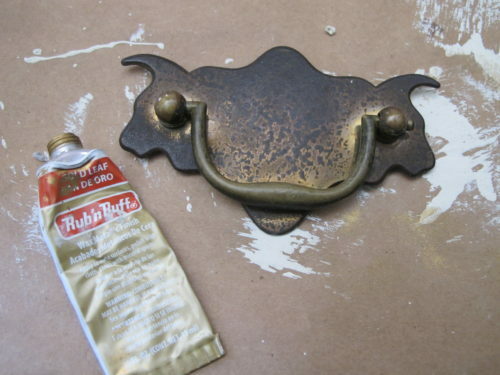 The furniture hardware needed some Rub ‘n Buff. Definitely not a problem. If you haven’t tried Rub ‘n Buff , get your hands on this stuff immediately! (Click here to buy Rub ‘n Buff from Amazon). 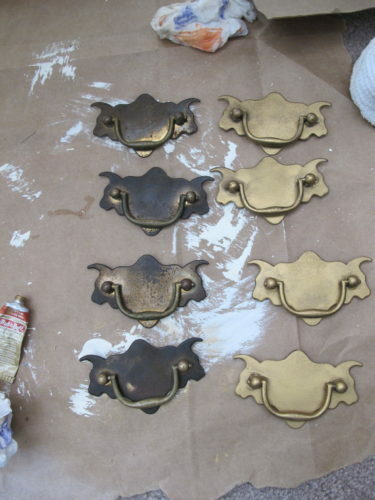 Although the hardware was beautifully shaped, they were tarnished. 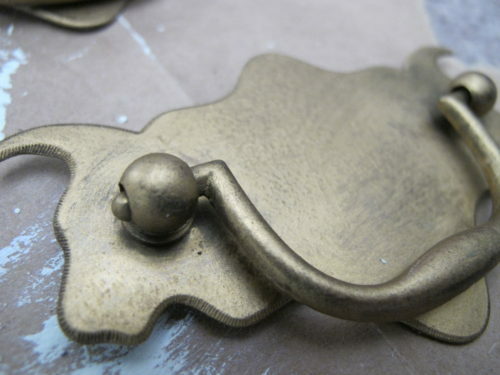 Rub ‘n Buff totally covers nasty old tarnished handles that have great shapes and designs but just needs an updated finish. I find it easier to use (and less mess!) than spray paint. Just rub it on, buff it out for shine, and you’re done! 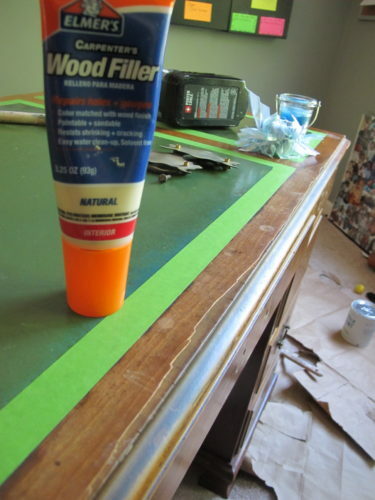 It comes in an array of colors, and I’m thinking about getting the whole set of Rub ‘n Buff, which is only about $30. Pretty affordable! 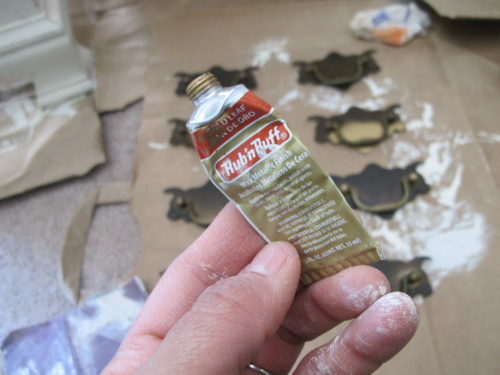 Rub ‘n Buff is one of my top 15 DIY “must have” tools and supplies! 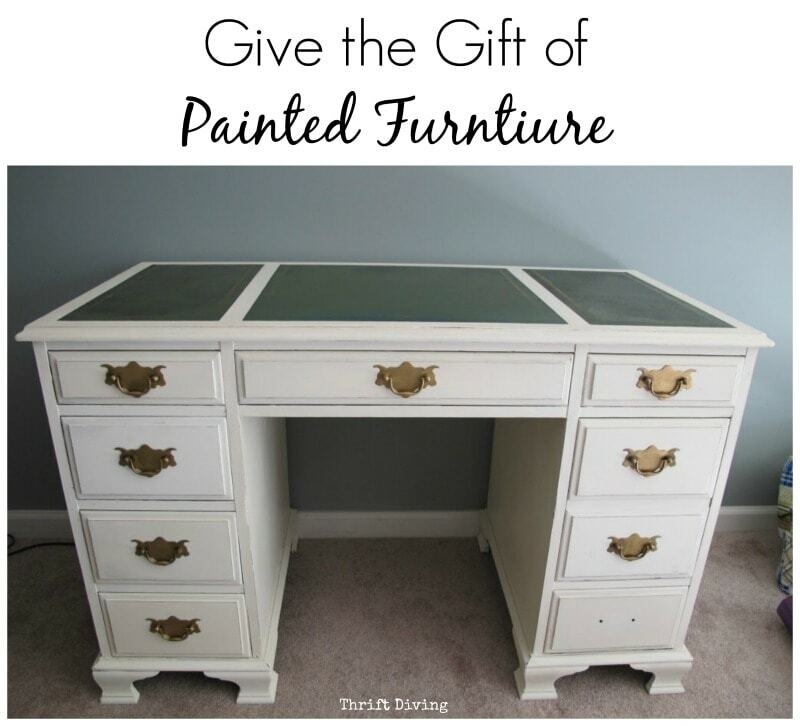 I’ve used it in several projects, like my green and gold “Agenda” desk and some other cheap DIY gifts that have made for people. I love that stuff!!! 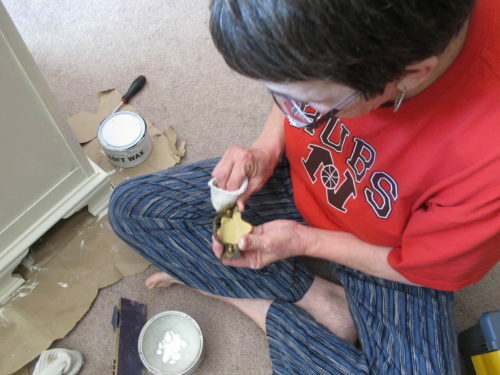 Mom had never even heard of Rub ‘n Buff before, so I put her to work trying it out. She couldn’t believe how it totally changed the hardware! A dramatic “before” and “after” when you see them side by side, huh?! Considering that I had all the materials I used already and that I didn’t have to buy anything separate, this desk project cost me nothing, really! 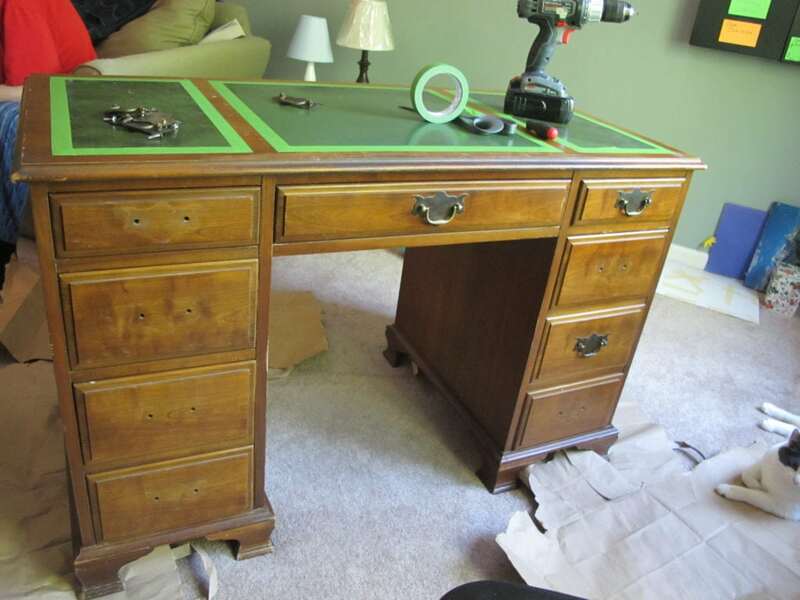 So, for $28 (the cost of the desk initially), my mom’s got a fabulous, beautiful, sturdy desk for her office corner, and she and I had a chance to bond! 🙂 SCORE! 4. Write a letter of thanks and appreciation. Use pretty paper! 6. Record a video telling her how much she means to you. Put it on a CD she can keep forever. 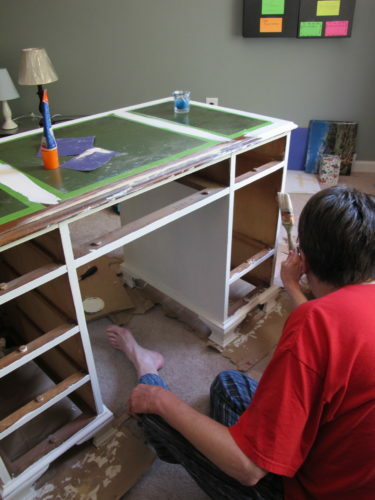 What are some great DIY gift ideas do you have for your mom or other special people in your world? « Reduce, Reuse, Recycle: A Painted Lamp Makeover! I’ve never heard of the Rub and Buff. What color do you recommend having as a “staple”? Hi, Debbie! I would definitely recommend the golds! They have a few shades of them, so I’d get a couple and keep those on hands. You never know when you want to update hardware with it, or any number of things!